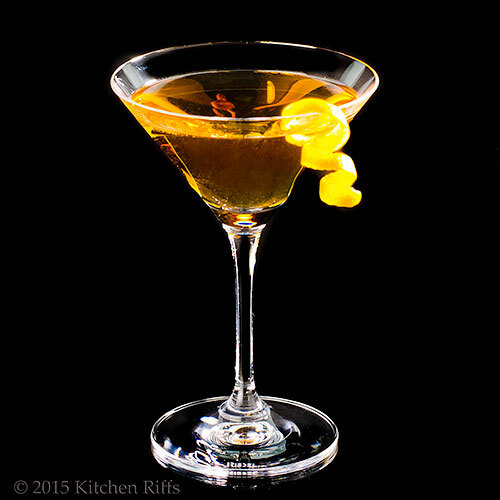 El Presidente was named in honor of an early 20th-century president of Cuba. Or maybe two different presidents (more about that in the Notes). No need to worry about the name, though. What’s important to know is that this cocktail has a wonderful “nose,” with a slightly sweet flavor. It’s crisp and refreshing, a wonderful accompaniment to the savory appetizers you’ll be serving at warm-weather festivities. And speaking of festivities, this Sunday is Father’s Day here in the US. Families will be gathering to toast the leader of the clan. So what could be more appropriate than a round of El Presidente Cocktails? Hail to the chief. Back during the Prohibition era, Cuba was a favored playground for thirsty US citizens with the means to travel. They enjoyed the fun and sun, of course—Cuba had great beaches, restaurants, and entertainment. But it was the availability of booze that really drew Americans to the island. Rum (especially white) is the liquor of choice in Cuba. So barkeeps served lots of rum-based drinks, many of which are still popular today. The Mojito came from Cuba, for example. As did the Daiquiri. And of course El Presidente. There are a couple of different variations on this cocktail (see Notes), but the classic combines white rum with dry vermouth and orange curaçao. We like the version that cocktail historian extraordinaire David Wondrich mixes, so that’s what you find here. This recipe takes about 5 minutes to prepare, and serves 1. Place all ingredients (except garnish) in a mixing glass half-filled with ice. Stir briskly until well chilled (20 to 30 seconds). Strain into a cocktail glass, preferably once that has been chilled. Garnish (if desired) and serve. Why stir rather than shake this drink? Because the ingredients are clear. Shaking can introduce small bubbles, which make a drink cloudy. This isn’t a problem when the ingredients are opaque (think citrus juice), but it can be unattractive when the ingredients are clear. When garnishing, it’s best to hold the citrus over each drink as you trim off a twist or peel. When you cut into the citrus, you’ll release some of its oils—and by holding the citrus over the drink as you do so, you’ll let the oils impart additional flavor and fragrance. Bacardi is the most popular brand of white rum in the US. It originally was distilled in Cuba, but moved its production to Puerto Rico after Fidel Castro’s government seized its Cuban assets. The Cuban distillery that used to produce Bacardi rum now makes a brand called Havana Club, which is marketed in most of the world except the US (because of a decades-long US trade embargo with Cuba—which finally appears to be in the process of ending). We’ve never tasted Havana Club (because it can’t be sold legally in the US), but many people say it’s better than Bacardi. If it’s available in your market, we say give it a try. BTW, if any of our readers have done a taste test between Bacardi and Havana Club, we’d love to hear your opinion on the two. Orange curaçao is an orange-flavored liqueur (similar to triple sec, but sweeter). 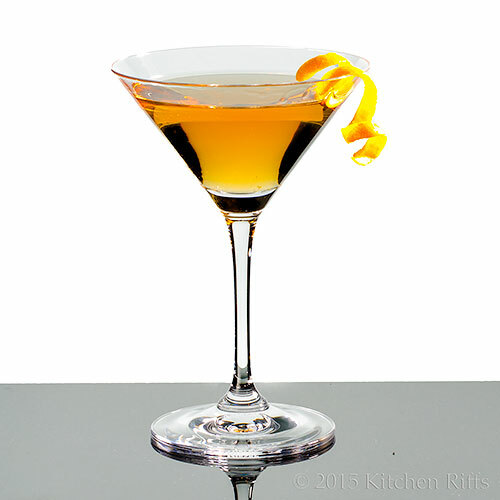 Grand Marnier is a form of orange curaçao, and it works well in this drink. A somewhat cheaper alternative is the orange curaçao produced by Marie Brizard (that’s what we use in this drink). Our usual reminder: This blog is noncommercial and we’re not compensated for suggesting brands. We recommend only what we like and buy with our own money. Real grenadine is made from pomegranate juice and sugar (and sometimes orange blossom water). The brand of commercial “grenadine” you’re most likely to find at your local supermarket or liquor store (Rose’s) contains no pomegranate, just artificial flavors and coloring. We advise you to stay away from this, and instead make your own Homemade Grenadine. It takes just minutes, and you’ll be happy you did. Some recipes increase the amount of orange curaçao in this drink to ¾ ounce. That’s too sweet for us, but you might like it. 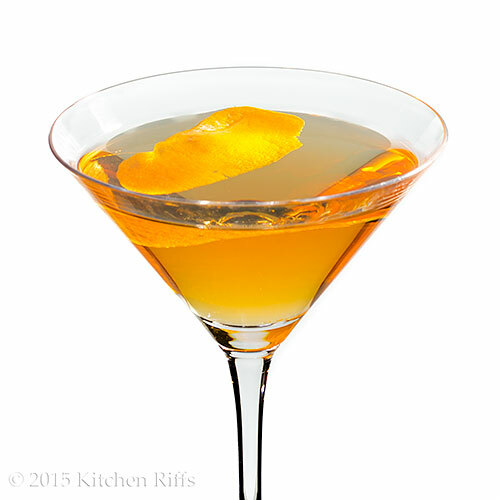 Other recipes reduce the amount of dry vermouth to ½ ounce (while also keeping the orange curaçao at ½ ounce). This tastes unbalanced to us, but again you might like it. 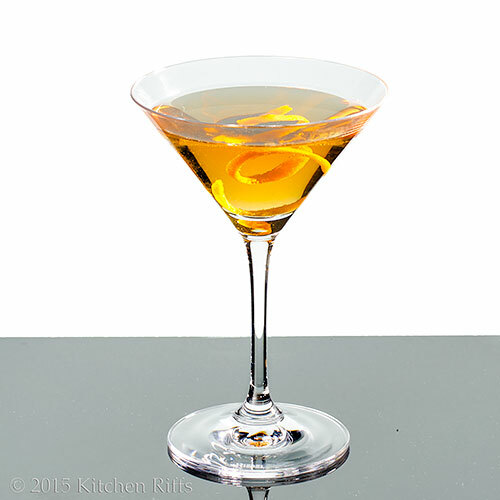 Some recipes use amber rum instead of white in this cocktail. We prefer white, but the amber rums do have additional flavor (and often some age to them), so that’s worth an experiment. The folks at Bacardi claim that amber rum was used in the original El Presidente Cocktail—which they say was created to honor President Mario García Menocal, who presided over Cuba from 1913 to 1921. Supposedly, Menocal wanted a cocktail that would surpass the Manhattan, which uses sweet (red) vermouth. So his version of El Presidente contains 2 parts gold (amber) rum, 1 part sweet (red) vermouth, and a dash of Angostura bitters. We’re not really sure who created this version of the drink, or when. But apparently the “classic” El Presidente (similar to the one we feature in this post) was created by Eddie Woelke at the Jockey Club in Havana, probably during the mid-1920s. He was said to have named it after then-president of Cuba Gerardo Machado, who served from 1925 to 1933. “Well, researching classic cocktails at their source is certainly educational,” said Mrs K R.
“True, we could get months’ worth of recipes,” I said. “And everywhere he went, he visited bars—lots and lots of bars,” said Mrs K R.
“Heck, tracking down all his old haunts could take a month, maybe two,” I said. That’s my Mrs K R—always a tireless worker. With such a reverence for learning. Wow this drink is crystal clear yet still looks like a sunrise. Great tips as always for the novice drinker like me. So have you booked your trip yet? Hi Vicki, it's a fun drink! Loads of flavor. And we're really, really tempted to try to book such a trip! ;-) Thanks for the comment. Sounds like a great reason for a trip! Hi Lydia, it does, doesn't it? :-) Thanks for the comment. Hi John, great tips, sounds like a wonderful drink! Love the dialog, Cuba would be a very interesting place to visit indeed. Well it could be to the announced president wannabe corporate tycoon too as of today lol! Great cocktail, not to harsh and not too sweet, perfect for me. Happy leader of a clan day! Hi Raymund, it is, it is! ;-) Thanks for the comment. Hi Cheri, wouldn't Cuba be fun to visit? Would love to go there sometime! Thanks for the comment. Hi CEE, LOL! Very funny. ;-) Thanks for the comment. Great drink for Father's Day, John! Bet it tastes great and the color is pretty great too! I'd really like to go to Cuba to enjoy one! Here's to you and all other leaders of the clan! What an adventure that would be. My husband has been to Cuba (work related) but said it was gorgeous. You should do it! And thanks for making a drink for me - love rum (not gin -haha) so I must try this soon! I love research don't you???? Thanks so much for the tips!! Especially the shaking v stirring. I never thought of that. I shake everything! I have had this drink in Old Havana! Finally, something you write about that I've actually enjoyed. :) This was before many tourists were visiting so I imagine that it's much different now - thankfully. This is a lovely drink and it brings back good memories or our friend and guide Alberto. Hi Nee, it'd be fun for you and hubby to have this at the source. ;-) Thanks for the comment. Hi Pam, fun color, isn't it? It'd be great to enjoy this in Cuba -- maybe we can arrange a group trip. ;-) Thanks for the comment. Hi Tricia, lucky husband! We really want to go at some point -- will probably wait until it becomes a bit easier to do so. And yup, research is wonderful stuff! Thanks for the comment. Hi Nagi, we often shake too and break the rules. But stirring clear liquids does result in a prettier drink. ;-) Thanks for the comment. Hi Liz, isn't this pretty? After you cut a twist, wrap it around a straw or some other round pole-like thing with a fairly small diameter. Pull the twist tight and hold for a minute, and the twist should retain its curl for quite a bit. Thanks for the comment. Hi Maureen, lucky you! Really want to go to Cuba -- we will, some day. Happy to bring back good memories for you! Thanks for the comment. Great photo, John.....I bet that tastes delicious! Thanks for sharing with us the history behind this drink. It looks as sunny as Cuba. Hi Pat, it's wonderful! ;-) Thanks for the comment. Hi Denise, fun history, isn't it? And it is a sunny drink. ;-) Thanks for the comment. Well father's day very well may be a day to remember with this drink ;) - or wait, not remember? LOL! Looks lovely I bet it tastes as good as it looks. Nice photos, and thanks for the history lesson :). Hi GiGI, definitely a day to remember! ;-) Thanks for the comment. Hi Amira, it does taste as good as it looks! ;-) Thanks for the comment. Your cocktails always look so good - John! I love the tips about making the drink simply superb. I'm in Canada so I'll check and see if Havana Club is here and will let you know. Loving your blog - your humour, the fun history, photos, great drinks - always a pleasure to visit! Hi Rachel, thanks so much! Hi Robyn, you definitely can get Havana Club in Canada! Which is a good point: next time I visit there, I'll check both out. :-) Thanks for the comment. My husband would really dig this one! Such an elegant and sophisticated drink! Hi Pam, your husband has good taste! :-) Thanks for the comment. Hi Laura, it is! And darn good, too. ;-) Thanks for the comment. Hi Ray, I think any president would enjoy this! Thanks for the comment. That is such a beautiful drink! Hi Peachy, isn't it? Lovely flavor, too. Thanks for the comment. Sounds like a wonderful cocktail. It sounds perfect for sipping on Father's Day. Hi Dawn, it's a really nice drink! Dads everywhere will enjoy it. ;-) Thanks for the comment. Sounds amazing! Lovely idea for Summer nights! Hi Marcela, this is a perfect summer drink! Refreshing and tasty. ;-) Thanks for the comment. Hi Charlie, hope you had a great time in Bali! We've never been, but it must be a wonderful place to enjoy cocktails. ;-) Thanks for the comment. Hi Amy, you'd be very welcome! We could try several. ;-) Thanks for the comment. This looks classy and delicious! Great job! Hi Pamela, it really is both classy and delicious. Just a good drink! Thanks for the comment..
Hi Greg, I believe the Havana Club one buys in Miami is actually produced by Bacardi, and isn't from Cuba. Really complicated legal stuff including the US Supreme Court weighing in -- more details in our post on the Bacardi Cocktail (http://www.kitchenriffs.com/2013/06/the-bacardi-cocktail.html). Upshot is Bacardi has rights to the Havana Club name in the US according to US courts, but the World Trade Organization doesn't recognize this right. So the Havana Club one can find in the US (only in Florida, as far as I know) isn't the same Havana Club the rest of the world drinks. Really complicated! Thanks for the comment. Looks interesting. I bet it tastes uniquely and maybe addicting too. I love the color. Looks so pretty and sounds like it has a really fun history! Hi Chris, this drink does have an interesting background, doesn't it? And it tastes great, which is the most important thing! Thanks for the comment. No idle time for sightseeing? Sounds like they are off to a great start! Where do cigars enter into this? I'm with Mrs. KR, but my Manservant might be with you John; researching rum and cigars! In any case, I guess this drink is a good way to start! Hi Abbe, well, I think we'd figure out a way to make some idle time. :D We should set up a food bloggers road trip to Cuba. Research of some kind or another. ;-) It'd be loads of fun! Thanks for the comment. Loved your dialogue. It would be awesome to visit. That drink is sheer perfection. Although hubs doesn't have alcohol, I will be making it this Sunday and enjoying it. Your drinks are always presented perfectly. My husband was given a bottle of Havana Club and he said it was good but he thinks its allure here in the states is because you can't get it. Hi Asha, enjoy! This is a fun drink, and I think you'll like it. :-) Thanks for the comment. Hi Karen, thanks for that info! Making white rum isn't all that complicated, so I'm not surprised there isn't that much difference between the two. ;-) Thanks for the comment. Hi Lux, it's really a fun drink! Thanks for the comment. Hopefully one of these days soon we will be able to try Havana Club bacardi here in the U.S. Love the clarity of this drink and what a nice color. Interesting information around this drink. Thanks for sharing! Hi MJ, we can only hope we can get Havana Club soon. ;-) Thanks for the comment. Hi John , I wish you a very happy Father' Day , just sit back and relax with a couple of your wonderful cocktails. Hi Nee, actually we'll be doing a dinner tomorrow for my father, who's 94! Lucky to have him still. Will definitely be getting by on Monday. ;-) Thanks for the comment. This cocktail looks absolutely gorgeous! If my dad like cocktails, I would make him this in a heartbeat. Hi Cathleen, it's a pretty drink, isn't it? But then, I've never seen a cocktail I didn't think was pretty! ;-) Thanks for the comment. Oh my word, John, still dishing up those infamous cocktails and chatter, lol...I sure could use the drink and the trip right about now! Hi Louise, so glad to hear from you! Thanks for the b-day wishes -- and if you think your singing voice is bad, you wouldn't want to hear mine -- kitties howl when they hear it. ;-) Thanks for the comment. Hi Carolyn, those conversations are really fun to write! Glad you like them -- they're really the highpoint of post writing for us. :D And liquid research is good, isn't it? Thanks for the comment. Your site has become a reference point for the bar guys at my work. We decided after the success of the last 3 weeks we may as well just keep serving the classy cocktail that our punters love. Looking forward to trying this one. Hi Anna, classy cocktails are good. ;-) Thanks for the comment. You take the best darn photos of drinks! Makes me want to stir one up and re-watch Buena Vista Social Club. If you've not seen that documentary, I'm pretty sure you'd really enjoy it. I can actually visit Cuba for pleasure :) Haven't gone yet but I'd love to, sounds like a fascinating place to visit. This drink is amazing, crystal clear and your photos, esp the second one is beautiful! Hi Lea Ann, we've never seen that! I think you're right -- we'd like it. ;-) Thanks for the comment. Hi Nazneen, lucky you! ;-) It really does sound like a fun place to visit -- we can't wait until the US relaxes its laws so travel there is easier. Thanks for the comment. I'm wanting to try this great looking beverage, so it's been pinned for good measure. I enjoy the detailed information you provide. Thanks, John! Hi Brooks, it's a fun drink. Enjoy! ;-) Thanks for the comment. This sounds delicious, lovely colour too. Hi Caroline, it's really a good drink -- quite nice flavor. ;-) Thanks for the comment. Rum has always been my favorite. I'll be keeping an eye out for Havana Club. I hope I find it some day! Hi Lisa, we like rum a lot, too. And it's so nice in this drink! Thanks for the comment. Woo hoo! That would be awesome! Happy Birthday, too! Hi Zoe, stirring does make a prettier drink in this case. ;-) Thanks for the comment. I might need a couple of these cocktails today (maybe one of each variation). Thanks for the recipe and love those shots!! Please do a tutorial on how to shoot cocktails! Now that is one classy drink John! I hope your Father's Day was grand and that the kids made you a double El Presidente Cocktail. Love the rum and the orange and citrus flavors. Stirred and not shaken so that it is clear and beautiful. Sharing this beautiful drink! This drink sure does look refreshing! I remember my father was booked to go to Cuba in the late 1950's but then was advised not to go. Everything seems to go in circles nowadays! Hi Yi, always worth trying different variations of drinks! So interesting how each one differs a little from the others! Thanks for the comment. Hi Kiran, maybe I will one day -- I've been thinking about it! Thanks for the comment. Hi Bam, this is a great drink! And stirring really does make a difference with this one. Thanks for the comment. Hi Fran, everything does indeed seem to go in circles! I'd love to go to Cuba one of these days -- hope it's possible soon! Thanks for the comment.